Police are searching for Nial Koporo after 20-year-old Tyrone Mullinde was seriously assaulted in Bridgwater earlier this month. An eyewitness has described his experience after the Westminster terror attack yesterday. Steve Voake from Somerset was visiting his daughter in London. Devon and Cornwall Police has increased the number of patrols, which include several armed officers, following the terrorist attack in London. While there are no specific threats to the region, the force is urging people to remain alert and vigilant. The threat level for the country remains severe. Assistant Chief Constable Russ Middleton said: “The events in London are a timely reminder of the need to remain vigilant and report any suspicious activity you may see." "Although we have no information to suggest any specific risk to Devon, Cornwall or the Isles of Scilly, I would ask the public to keep alert and not alarmed, and to support us in keeping our region safe." "The impact of yesterday’s events will be felt for some time and our condolences go to the families of the police officer and members of the public who have died and been seriously injured as a result of the attack." “Local people may see some increased patrols locally and might also see a more overt armed presence from officers. I’d ask the public not to be fearful of this, but to feel more secure that steps are being taken to ensure their safety." The West Country fell silent for a minute this morning to pay tribute to the policeman and two pedestrians who lost their lives in the terror attack on Westminster yesterday. The Met Office in Exeter was just one the locations across the region which held a tribute. A candlelit vigil will take place in London at Trafalgar Square this evening. 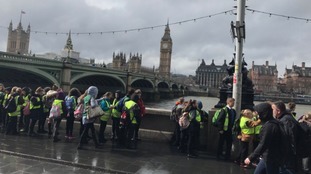 More than 50 primary school children from Somerset, who were caught up in the terror attack in Westminster, have returned home safely. Police forces across the region have been paying tribute to an officer killed during the terror attack in Westminster.